Quick thoughts on the LAKE PLACID franchise. I just finished watching Lake Placid: Legacy. It's the latest in the franchise from Syfy, premiering May 28, 2018, on TV. So, naturally, I popped the original movie in and am watching that now. The first film came out the summer of 1999, just a month before I entered middle school (sixth grade). I was already a huge Jaws fan and I jumped at the chance to see this. 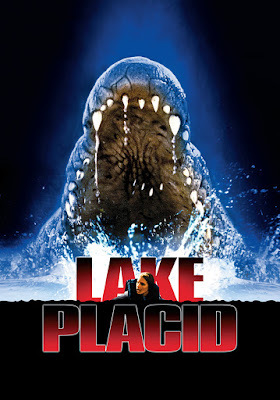 Unlike Deep Blue Sea, which came out the same month, I didn't get to see Lake Placid in theaters, but I did rent it almost immediately upon home video release. I loved it. I thought it was funny and scary and had a cool-looking killer crocodile. And to this day, I still love it. Thinking about early FREDDY VS. JASON publicity. 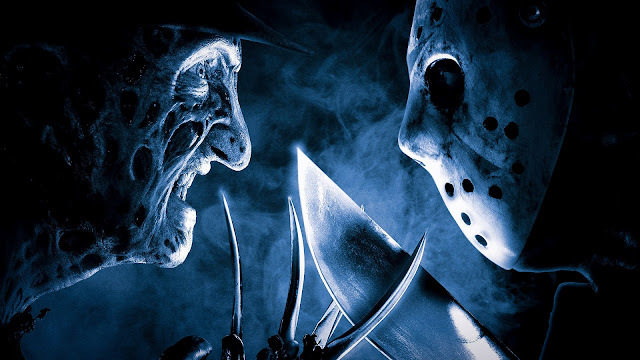 Y'all remember the hype-train that was Freddy vs. Jason, right? Well, I do. And recently, I've been thinking about it. And the initial false start the project had. So I'm going to take a quick trip down memory lane for a moment. Here is the original promotional flyer from 1997, back when FvJ had a planned 1998 release date. Now, this is nothing new. I'm sure you've all seen this old flyer posted somewhere on the net. It's clearly a quick thrown-together sales art job using the chrome mask from the Jason Goes to Hell poster art. And I believe that's Freddy's glove from either Freddy's Dead or The Dream Child. Either way, it was enough to get the fans salivating. What's most intriguing about this poster art is that it wasn't just a close-to-the-vest project around Hollywood. Not at all. In fact, the main art on the flyer was actually used as a teaser poster and was displayed in a few theaters. Not many, but some. Win DAPHNE & VELMA on Blu-ray! I'm sure you've heard by now that a Daphne & Velma movie was in the works. Well, it' time for that sucker to be released! And guess what? You can win a copy of the Blu-ray right here on MorbidMuch! Check out the app below and let me know what you think of Daphne & Velma in the comments below. A winner will be chosen from the comments. FRIDAY THE 13TH copycat killer cancelled HALLOWEEN 4 in one small town. 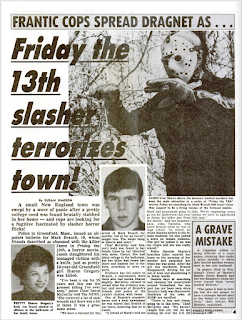 On October 24, 1988, in Greenfield, Massachusetts, 18-year-old Mark Branch headed out in full Jason Voorhees fatigues. Mark wasn't trick-or-treating early, however. No, Mark was on his way to kill Greenfield Community College freshman Psychology major Sharon Gregory. Mark Branch was a known horror movie fanatic that was obsessed with the Friday the 13th film franchise. More specifically, he idolized the fictional Jason Voorhees, Camp Crystal Lake's local hockey mask wearing, machete wielding boogeyman. It is said that Mark murdered Sharon Gregory over a profile she had written about him. The two were supposed "friends." Apparently, Gregory had found him fascinating and knew there was something "off" about Branch. This led to Branch wanting that written profile...by any means necessary. It all sounds like something ripped from a horror movie, and in a weird sort of way, it is. I noticed that Prom Night (1980) was streaming on Amazon Prime. So, naturally, I gave it a re-watch. It's been several years since my previous/initial viewing. I have a few takeaways from this revisit. The first thing that stuck out like a sore thumb was the hazy dream-like filter that's all over the entire movie. It annoyed the hell out of me at first, but it eventually grew on me and gives the film a unique charm. It's not overly distracting, but it does take a few minutes for your eyes to fully adjust to it. All the early-morning scenes in the movie are visually stunning. A few years ago this is isn't something I would've noticed or paid too much attention to. But those awesome and eerie early mornings where there's a thick fog and a layer of dew on everything is perfectly captured in this film. HAPPY DEATH DAY 2 & what to expect. So it has finally been officially confirmed that Happy Death Day 2 is happening. But not only is it happening but the stars from the first movie -- Jessica Rothe and Israel Broussard -- are returning for the sequel. I'm happy about this because this movie's concept is something that easily lends itself to that dreaded straight-to-video realm (or in this case, straight to VOD). So getting a "real" sequel is cool...and it starts filming on May 10...like, 7 days from now. Now, I never made it a secret that I loved the first Happy Death Day (see my review here). I thought it was a cool story with an interesting killer and an exceptional lead in Jessica Rothe. So I am excited about this sequel. I'm curious as to where the story will go. On Set Cinema is a real and awesome thing. Have you heard of On Set Cinema yet? 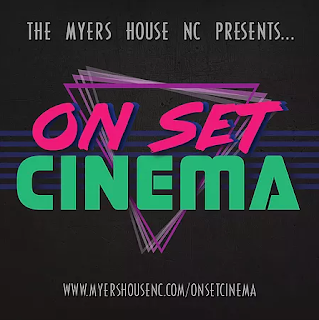 It's something my friend Kenny over at The Myers House NC is putting together where you can watch movies at their filming location! How cool is that?! Their first screening will be Empire Records on June 9 and will be held at Restaurant Rebellion, which served as Empire Records in the film. But the real highlight -- for me, anyway -- is the July 7 screening of I Know What You Did Last Summer, which will be held at Harrell's Department Store (which was Shiver's Department Store in the movie). I'm so insanely jealous of the people that get to attend these things. Unfortunately, my schedule doesn't really allow me the time to do such things. My three favorite whodunit slashers! We all know Scream. It's that little tiny movie directed by Wes Craven and written by Kevin Williamson. Oh, and you know, it brought horror films back from the dead in the mid-'90s. You've heard of it, right? Up until 1996, nothing quite like Scream had ever come along. It's a smart, tongue-in-cheek parody of slasher films that holds its own and is scary as hell.